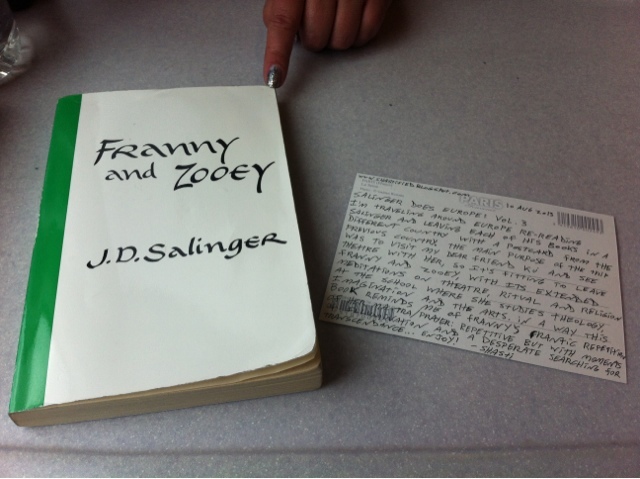 I left Franny and Zooey with Kj at Deans Court library in St Andrews, Scotland, with a postcard from Paris. It was perfect, really, to leave it there — Kj is studying Theology, Imagination and the Arts, and I visited her partly for the purpose of attending a bunch of theatre together at the Edinburgh Fringe Festival. Franny and Zooey is heavily concerned with theatre, acting, imagination, ritual, and religion, so it was an absolutely perfect fit. The book is in two parts, about the two youngest Glass children, who are in their early 20s at the time. Franny is lost and attempting a prayer mantra to find herself/God. Zooey is an actor, slightly older, and the most well-adjusted of the family, though that’s not really saying much. He’s trying to help her cope but is failing miserably. It’s not my favorite of his books, but I think it reflects in the writing much of the repetitive, desperate searching that Franny is doing, with flashes of Zooey’s frustration and brief moments of transcendence/clarity/veil piercing. I’d say it’s successful because of that, but as an extended character study I don’t love it and I find it difficult to connect with either of them. Still definitely an important part of his work, just not my personal favorite.